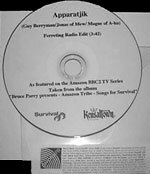 Apparatjik, the band consisting of Guy Berryman (Coldplay), Jonas Bjerre (MEW), Magne F (a-ha) and producer Martin Terefe recorded the track "Ferreting" for the end credits of the BBC series "Amazon". The track was included on the album Bruce Parry presents Amazon Tribe - Songs for Survival and was released as a radio only promo CD single and there are two different versions available, both feature the "radio edit" (3:42), but only one of them refers to the track as being an edit. Both discs are white with the titles in black with the "Survival" and "Kensaltown records" logos at the bottom. It comes in a PVC sleeve with a white sticker with release date and information.